So Eve and I went to the exhibit of Frank Lloyd Wright stained glass at the Renwick last month. I've said before that Frank Lloyd Wright's designs aren't really to my taste, as I often find very geometrically styled art to be a little on the arid side. But, as I suppose is true for most artwork, it's really best to judge it up close and in person. Standing in the gallery and looking at the work, I found myself struck more by the rigor and intricacy of the work, than by all the straight lines and hard angles. The pure craftsmanship of the work is also something you can't focus on while looking at two-dimensional printed representations of the glass panels. Although, I'd be curious to know how much of Wright's cutting and leading he did himself, and how much he delegated to flunkies. Was he more artist or craftsman? Glass artists often lament how hard it is to get a good photograph of their work. And it's true. I snapped a few photos, before noticing the too-discreet "no photography" sign. But they do not at all represent the aspects of the panels that fascinated me: the glass which had, at some point a hundred years ago, been gilded or iridized but now shows almost no sign of either; the putty beginning to crumble in spots but altogether impressively solid considering the age of the work; the flashed glass that I had to hold a couple of sneaky fingers behind to verify its near-total opacity; the brass and copper cames which I've never seen used before and which I will never use myself because I am too fond of curves; the tiny tiny scale of some of the pieces of glass, which dispels any notion of straight lines being the fastest road to an "easy" panel. Above is a sample window (on the left) from the Susan Lawrence Dana house in Springfield, Illinois, dating from 1902-04, and three panels from the J.J. Walser Jr. house in Chicago, circa 1903. 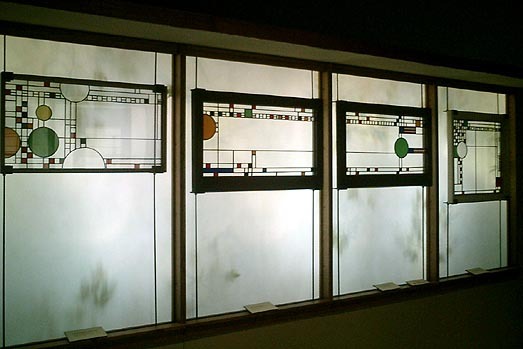 Above are four panels from the Avery Coonley Playhouse in Riverside, Illinois, 1911-1912. And I need to point out here that I'd previously assumed that "playhouse" meant a performing arts center---but what it actually means, in this case, is... a kindergarten. Imagine four-year-olds scampering around with sammich hands and runny noses... in a building fully tricked out with Wright windows and furnishings. Amazing. Froebel blocks, developed in 1830s Germany, are sets of wooden blocks to teach children about geometric shapes and patterns. Wright had been given some by his mother when he was a child, and wrote in his autobiography of how strongly they had influenced his life's work. The exhibit had a window made of prismatic glass tiles, a Wright invention about which I wrote back in November (here and here). Neat to see them, but it would have been so much neater if they'd been displayed in such a way as to make their function apparent. There would have been an undeniable "wow" factor in seeing a light source redirected to a wall in the back of the room using the prismatic glass tiles. As it was they were just sort of hanging there, looking as if they were trying to be decorative and failing. Innovative as they are, they're not much to look at. Google helped me find a complete checklist of works included in the exhibit, on the press information page for the Smithsonian American Art Museum. The exhibit runs through July 20th. 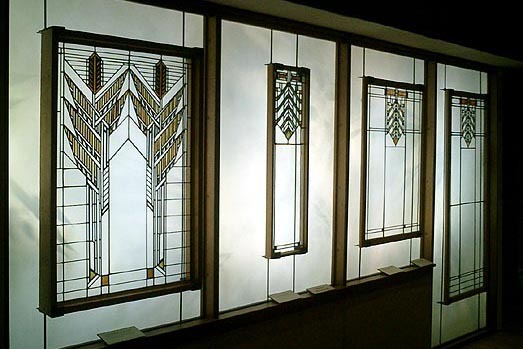 I mentioned before that Nancy Underwood, owner of Weisser Glass Studio in Kensington, would be doing a leaded glass demo at the Renwick in conjunction with the show. That has passed---weekend before last, I think---but there's another demo scheduled, for the last day of the exhibit at one p.m. It's being given by none other than Jimmy Powers, with whom I'm currently taking my second glass class at the Art League. He's a nice guy, a very knowledgeable glass craftsman, and a great, encouraging teacher, so if you're curious to see stained glass built before your very eyes, don't miss his demo. If you need further convincing, remember that the Renwick, as part of the Smithsonian Institution, costs not a penny for admission. 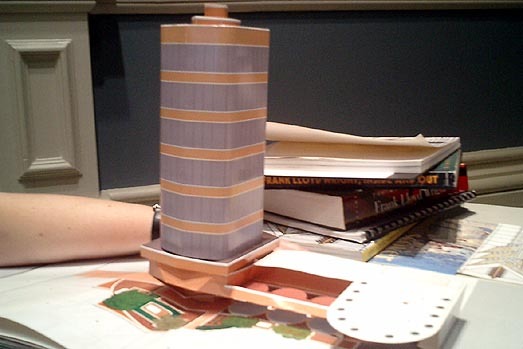 On the one hand, since FLW built 769 buildings in his career, I'd seriously doubt he had the time to do any hands-on work whatsoever ... though, on the other hand, he was a perfectionist of such imperial proportions that I wouldn't be shocked, either. .. and it was all just so ... cool. Im usually not a big geometric fan either, but there has always been something about FLW's stuff that spoke to me. Maybe it's the remarkably clean aesthetic. Maybe it's how something as ordinary as a skinny piece of glass, repeated in a pattern, has a rythm that draws me in. It was a great exhibit -- certainly worth a trip, even if you're not a glass freak like me and Michelle. Next time you come to NY, you *must* go to the Met -- they have both Frank Lloyd Wright *and* Tiffany windows on display. I've got some pictures of both I can dig up, but no comparison to seeing it in person. Eve: I prefer the term "glass geek," thank you very much! Roe: I think Kim has mentioned that very thing before, as well. It sounds super-cool. I *am* kind of overdue for a NY trip, I think. Although, uh, I'm going to be a college freshman for the third time in ten years starting in another couple of weeks, and I'm trying not to think about what that will do to my free-time allocation. Yeah, I thought so too, until I saw what they charge for *one* stinking art history textbook goes for. I am seriously in the wrong line of work. I'm just now playing catch-up on the last month's worth of posting. Bad loren!